Sheryl Intrator Urman, Englewood artist, curator, art historian lecturer and art teacher, is exhibiting her work with Salute to Women in the Arts, in the exhibit “New Beginnings”. Reception: Sunday, January 6th from 2:00 to 4:00 pm. Open to the Public. The Art Center of Northern New Jersey, 250 Center Ave., New Milford, NJ 07640 from January 6th – January 27th. 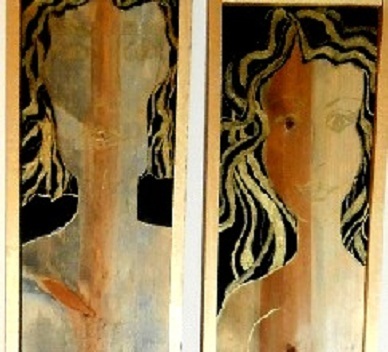 Intrator – Urman, creates vibrant, expressive works of art on wood. 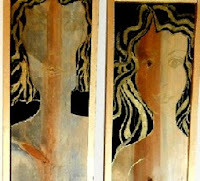 She uses glazes, oil paints and washes to bring out the figures hiding in the wood. Her entries into this show are part of a 26 piece series she has created around the concept of Adam and Eve. Intrator Urman has exhibited her work internationally, at museums and galleries. She is the creator of Art for Learning, LLC., an art business operating in Leonia and then Englewood for the past 16 years.